Thoughts from Haley – "What we find Changes who we become"
"What we find Changes who we become"
The words of the title of this blog stopped me right in my tracks this afternoon. I oftentimes ask God to speak to me when it seems as though His voice has been distant. Today, those words were louder and clearer than anything I’ve heard in a while. Let me first give some background–I fully believe that Haitians have blood that flows with the characteristic of “servant”. And I am not talking about the context of being made, forced, or even asked to do a service. I am talking about a humbling character that finds extravagant joy in doing things for others out of complete generosity. My explanation of that will never quite do the justice deserved, but it is an attempt at best. 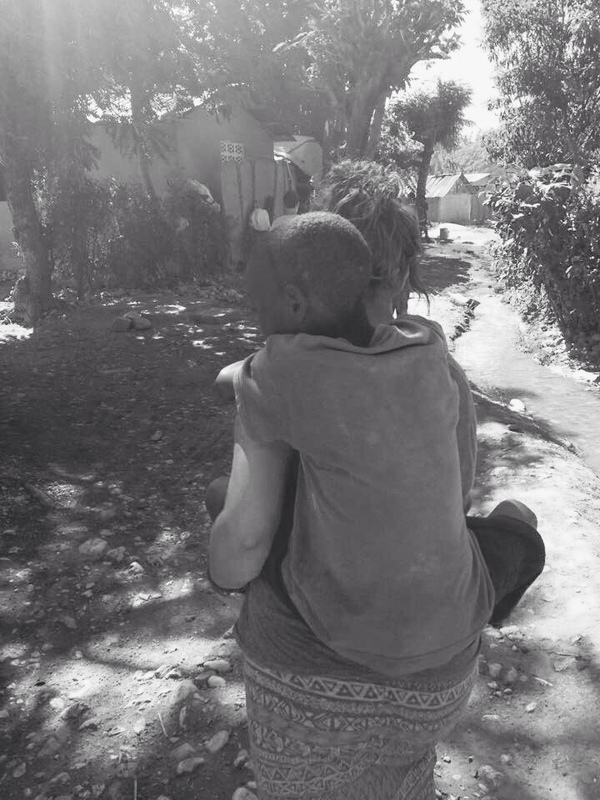 As soon as those words began processing through my mind, I instantly began jogging through the countless times over the past few months (and to be honest, maybe even this whole year in Haiti) where I was being told to just sit. In the times of doubt..the times of frustration..the times of fear..the times of confusion..even in the times of excitement..I’ve been told “I want you to sit..” and either didn’t know it or didn’t take it seriously. I can’t even accurately depict the times that has probably occurred, and yet the most subtle command from one of my sweetest friends here said it and it instantly clicked. It immediately reminded me of Jesus’s time with Mary and Martha as told in Luke. Martha (who I can unfortunately say I, 99 times out of 100, am walking in her same shoes) was concerned about Mary just sitting while she was running around doing all of the work. Jesus’s words to Martha were, “but few things are needed- or indeed only one. Mary has chosen what is better, and it will not be taken from her.”Martha chose to do do do-go go go. Mary chose to sit. She chose what was better. By choosing to sit, Mary was choosing Jesus, understanding that the things Martha was running around to do were of no importance compared to just being with Jesus and knowing him better. Many times throughout my days, I don’t choose to sit, and instead get “distracted by preparations that are needed to be made” as Martha was doing. BUT-I’m so thankful that on an ordinary Sunday afternoon, simple words spoken by my friend breathed a new spark in my heart that reminded me the importance of just sitting. There’s a Haitian proverb that says, Deye Mon Gen Mon, which means “Beyond the mountains, there are mountains.” For the longest time, I never really understood what it meant. I just assumed it meant there are a ton of mountains, and to me, that was a good thing. I live on the side of a mountain and still cannot get enough of mountains. I was actually on a hike to a school for work one day about a month ago, and I brought up this proverb to one of my Haitian coworkers I was hiking with. He explained to me that it’s not necessarily as optimistic of a proverb as I was imagining. “The mountains,” he said, “represent struggle..they represent difficulty.” I couldn’t seem to wrap my mind around it because I love mountains. I love hiking through them, I love looking at them, and I am always in awe of them. They’re beautiful and mysterious and they remind me of something far greater than myself. Yesterday morning I was taking off from Haiti on my way to America, and from thousands of miles in the sky, I was able to spot the house in which I live in Titanyen, Haiti. From a bird’s eye view, I saw the endless stretch of mountains behind my living quarters, and in an instant, I thought of the Haitian proverb. As I stopped my mind right there to sit on what the words of that proverb mean (and the view from being above all the mountains showed me) I realized something that would later that day become much more real.. In that moment, I grasped there really are mountains beyond mountains we are going to face. But I realized that, most times, we face mountains beyond mountains, not just mountains. God graciously allows us to approach one after another. It’s by the grace of God that we do not live our lives foreknowing all of the mountains we are going to encounter. When I set my mind on hiking to a destination at the top of a mountain, I can look at the mountain I am facing and know that I have the ability to make it. If I was able to see that every peak leads to another valley that leads to another peak that leads to another valley that leads to another peak (you see my point?) I don’t know that I would ever feel confident in my ability to persevere and make it through all the obstacles of the hike. The task would seem too daunting to press forward. I would be thinking about the future obstacles the whole entire time. It would completely take the joy out of the moment I am in. If there was an endless mountain range in front of me and I was to tackle it altogether, I don’t think that I would even begin to believe I could conquer it all. You see, I truly believe God gives us one mountain at a time and gives us what we need to conquer them, one by one. We’re not expected to face all of life’s battles at once, but rather throughout our life to refine us and grow us. The reality of this idea and this Haitian proverb set in after hearing about the tragic death of one of my friends from back home. If I had seen this hard-to-climb-peak was on its way two weeks ago, along with other mountains I was facing at the time, I wouldn’t have believed I had the ability to make it out on the other side. I wouldn’t have been present where I was to be intentional in what I was doing. I trust that one day, I will look back and see that this mountain was passed and I came to know Jesus better through it, but for now I am thankful that Jesus meets me right where I am at. I am praying even more that the family and other friends of my sweet friend can find Jesus or more of Him in the midst of something so heartbreaking. Complete comfort is only found in Jesus, and my heart so longs for that to be found by those most affected. Even through the sheer heartbreak I am thankful that God doesn’t ask us to stare down our whole life ahead and prepare for all that’s to come. He tells us in His Word that He gives us what we need today to get through today. We are told to not worry about tomorrow, because today has enough to worry about itself. Mountains are hard, but they are still beautiful. I pray that the difficulty of the “mountains” become equally as beautiful to my heart as their aesthetics are to my eyes. I pray that I continue to trust in The Lords provision—that everything, whether it be good or bad, is ultimately for good. I pray that they continue to remind me of something, Someone, far greater than myself or my wildest dream. I pray we believers and followers of Jesus would continue to stand strong in the faith and grow to love Jesus more and more.. to continue to appreciate each mountain he walks us over. And I pray for people who do not yet know Jesus, to come to know Him and love Him, for them to see that the same God who created the Earth loves them, died for them, and is the One to walk through these mountains with. Sometimes I feel that, in order to write my thoughts, it’s like mapping out and straightening a web of tangled mess. To ask me what my life is like is to ask me to begin to unravel the countless number of “uncertainties” and the few “certainties” that I’m aware of. As I, time and time again, have tried to settle these hovering thoughts, I’ve become more aware of a specific trend in my life. It’s one that begins with confusion and ends in contentment. As I briefly mentioned last night in a casual photo I posted on social media, the life I live is (at many times) confusing. I mentioned a few things that my life consists of in duplicates that makes my living a bit different than most others. I have two places that feel equally as “home” as the other does. With two homes comes two buildings in which I live, two beds, two families, two cultures, two mission fields, two lifestyles, two sets of norms, two standards of “cool”, two ways of communicating, and two wardrobes. My two worlds have yet to collide in big ways, and the anticipation of heading back to enter my other “home” in a couple of days has provoked a lot more confusing thoughts. Each new 90 days I visit the States will lead to the few hours of culture shock followed by the filling right back into the place I left 90 days prior, grasping the culture that I was raised in and lived in for 23 years. It’s a confusing life going between two cultures, not quite feeling like either is the perfect fit, and not completely molding into both, but at the same time loving both dearly. I’ve learned through all of that listed above, our God is not a God of confusion, rather He is a God of peace just as His word says. Even in the midst of confusion, my contentment abounds greater, and that’s only by the grace of God. On the hardest days at the hardest hours, I am reassured that I still wouldn’t have it any other way. My two lifestyles create me to be more me each new day. My two homes show me God in different, yet very constant ways. My God is in both places, at all times. He’s on the ground in Haiti. He’s with me through the traveling back, experiencing the small pierces of culture shock, and He is surely with me back in the States, reminding me to not forget what he has taught me on the other side. He provides an equal amount of community and encouragement no matter which “home” I am dwelling in. I am constantly reminded that He has set this work out in advance, and as I walk in it, I am growing to know Him better and become more like Jesus. That in itself is comforting, even through the fire of the process of the refining. To know I am right where I am supposed to be.. whether it be in my office with my Haitian coworkers, in my apartment with other women close to my age living this same lifestyle, in a village visiting my Haitian friends, meeting and talking with another North American who is on a short mission trip here, on a plane headed to the States, in a terminal reminiscing my past three months and trying to process to be able to share with friends and family, at my cozy home in Indiana, visiting friends in my college town, or even just spending an evening chatting about life with those who I love.. at those times, that is right where I am supposed to be. That’s what helps me to find contentment in the constant change. The Lord meets me where I’m at and takes care of my every need. My every want may not be satisfied, but He knows better than I and shows me that every day. Even to myself, in my own heart, my life seems to be beyond the reach of understanding. So, Jesus quietly whispers to me to remember Proverbs 3:5, “Trust in the Lord with all of your heart, and lean not on your own understanding.” If I were to lean on myself, I would fall every time, I still do fall at times. I fall into pits of wondering where I got to where I’m at and where I am headed next. One of my favorite songs we sing here says, “Pou kote’w mete’m. Pou sa ou fe nan lavi’m, ou gran.” // “For where you’ve put me, for what you do in my life, You are great.” I couldn’t say the word “thankful” in any tongue or language that would meet what its deserved for how thankful I feel on days I recognize the place the Lord has put me.Jesus reminds me that I got here by His grace alone, and I am headed on a continued journey of growing more in Him. Even though at times my life doesn’t make clear sense, the Gospel of Jesus Christ is not confusing. Jesus came to save. He came to redeem. He came to restore. He came to fulfill. He came to lot let me run dry. For those reasons alone, I am content amidst the confusion. As most of you know, I am spending a season of life in Haiti to do ministry and come alongside Mission of Hope in the pursuit of reaching every man, woman, and child there with the transforming power of Jesus. Days here are filled with great food, sweet conversations with the teams from America, and splashes of exciting and encouraging interactions with Haitians. Today marks day seven that we (nine other interns and myself) have been here on the ground in Haiti. There have been so many memorable things that have happened during my time here so far ranging from stories ending in laughter all the way to situations ending in apprehension. I have ridden on canters through the bumpiest roads, worshipped in a foreign language, swam through what seemed to be a sea of jellyfish, encountered conversations where the language barrier brought me to a point of some discouragement, had chill hammock time with the other interns, made friends with some of the Village of Hope orphans, seen more beautiful sights than I can account for, laughed until my stomach hurt with the other interns and staff, been poured into by the Executive staff at MOH and the other full time staff and team leads, held Haitian children almost as tall as I am, saw and chatted with sweet familiar Haitian faces, already said a few hard goodbyes to some of the sweetest people that came to visit and serve at Mission of Hope, and now currently fighting off tons of bugs as I attempt to use a lit up computer in a dark room. One of the things that I have been experiencing here in Haiti that has been so intriguing to me is the dust. Right now, in Haiti, it is dry season, which leads to a lot of dust flying around everywhere. Sometimes, it sweeps across the grounds through gusts of winds, and sometimes it isn’t always so obvious to recognize its presence..but yet you know it’s always there. After a day of being outside, my hair feels like quite the dust mop. Even my clothes and skin end the day with a nice tint of dust. It is so dusty that the Haitian children can cover their bodies with it to pretend to be “blan”–which is the creole term for “white person.” I remember coming last year and having a hard time feeling comfortable with being so dusty, but this time, it’s been more of an interesting thing for me to walk through. That might seem silly or odd, but as I was walking and looked down at my dust covered jeans, I remembered that the dust is exactly what we were made from, and it humbled my heart. At first, I had a reaction of “ew dust” to then end with a reaction of “wow dust.” During my time in Haiti, it’s so easy, even being involved in ministry, to forget why exactly I am here. In such a beautiful country, it is easy to feel as though I am on an extended vacation. It’s also easy for the enemy to peak in and give me insecurities of my lacking ability to speak Creole or my tiredness throughout the days. Walking around, looking at the dust covering my jeans, and remembering that God remembers we are dust reminded me of my being compared to His being. Psalm 103:13-14 say “Just as a father has compassion on his children, so the Lord has compassion on those who fear Him. For He Himself knows our frame; He is mindful that we are but dust.” I choose to be confident in knowing that He knows my frame, He remembers that I am dust, and He has compassion on me. He has safely brought me to Haiti with a purpose, not just to let me fend for myself. There will be easy/fun days to come, and there will also be tough and heavy-hearted days to come, but my God knows what I am able to bear and will walk along side me through it all. The reminder the dust here has given me has brought me to have such a content heart to rest in the fact that God has me right where he wants me. He is my creator and my perfecter. It has also brought me to a humbled heart, because He is in total control and it is by His grace alone that I am even here to begin with. My frame is weak and I am made from dust, but God loves me and knows what I can bear. He knows my every fear and my every temptation, and he gladly walks through them with me and reminds me that he loves me. The fact that we came from dust paints such a beautiful picture for me. He made creatures in his image out of dust– tiny particles of earth that lie on the ground or swift through the air. Instead of expecting perfection out of us, He came down to be perfect for us. His death and resurrection brings us life, and it is life that we can experience in full if we put our hope in Him alone. To most, dust is just something that makes us feel dirty and is something that we want to get rid of at any chance we can get. But to me, dust has been a beautiful reminder that we are loved and have a Heavenly father who handles us delicately and lavishes us with grace upon grace. A few weeks ago, I took a spontaneous trip to Utah with one of my friends (here’s a shout-out Bails). We just kind of randomly planned out this weekend long hiking trip, and what started as a weekend plan turned into a whole week long visit. We were able to travel a few parts of the state, see a few of the most beautiful national parks, and do some pretty awesome hiking during that week. At times, the views we saw of the mountains and canyons brought us to tears. It’s crazy how something can be that beautiful. The sights we saw were breathtaking, and views like that are such a reassurance that there is something so much greater than I am. It’s always such a humbling experience. Seeing things like that are guaranteed “Okay, God..I know you are here” moments. It was also just a good little break from reality back home. I didn’t have to worry about school work the whole time I was out there, and it was just overall a refreshing getaway. We came back with lots of awesome pictures, and even better stories. Some stories I have gone on and on about even up until this point. Some are funny, some are not, and some are just completely random..but those seem to be the ones I hold onto so closely. Those are the kinds of stories that make trips. You can be so excited to tell those kinds of stories to your mom and dad..they will just give you this look of, “was I supposed to laugh at that?” and you just still hold onto it so dearly. I have a story kind of like that, and as time goes on..I’ve held on tighter and tighter to it.. This story involves us meeting a guy named Freddy, and this particular guy had some thoughts that I would like to share. One of the nights that we went out, I was randomly approached by a guy standing next to us. The first words out of his mouth were, “I like your bracelet!”..(I wear a bracelet almost every day that says the word “hope”…. I responded with a, “Thank you,” just before he loudly said, “HOPE! !–I LOVE HOPE! Everyone’s got it!” I came to find out that his name was Freddy, and we quickly became friends because he liked my bracelet so much. I asked him what his hope was in, and his response was similar to a lot of other people I know, and even my 19 year old self….his hope, many people’s hope, my 19 year old self’s hope…was in himself, is in themselves, was in myself. Freddy loved this bracelet..this word.. so much. He loved it because his hope was in himself and his future and he trusted that was firm enough. Hope in those things was good to him, just as it is good to millions of other people in this world. As time goes on, that story becomes more real in my mind, and it saddens me to see his excitement for the hope he has in something that will disappoint unless it is anchored in something firm. Today while spending some sweet time with Jesus, I thought about Freddy’s comment on hope. All I could do was thank God for hope. I am so thankful for the hope I have in Jesus. I am so thankful that God showed me that the hope I have in myself or things of this earth will only disappoint. I am so thankful that God sent His son, Jesus, to bear our sins..our failures..our weaknesses..and defeat death so that I can rest my hope in Him. I now have this firm hope, one that will not break and does not deceive. This hope we have, as followers of Jesus, is fixed. It is external to us, proposed to us, and available for us to grasp onto. It’s a SURE anchor– one that does not drag, has found firm ground, and holders may trust to it. It’s a STEADFAST anchor– one that is firm, will not break, and strong in its OWN substance. There needs to be no fear in it snapping no matter what kind of strain is put on it. This hope in Jesus is free from all imperfections, and it doesn’t stop there. It is carried into the depths of the ocean, ones where we cannot alone go or see through. In anchoring ourselves to Jesus, we are anchoring ourselves to the very roots of God. As I read through that and realize how gracious God is to provide us with this hope, I also become so heartbroken for those who do not have hope in Jesus. My heart aches for those who place hope solely in themselves, others, things of this world..and my heart breaks even more for those who don’t have hope in anything. It weighs my heart down to know that this perfect hope is freely given, but not always received.As I thank Jesus tonight (and hopefully every other day) for the sure and steadfast hope I have in Him, I also pray that He reveals to others the hope they can have in Him. Back in March, I went to Haiti with a group of friends to serve and be the hands and feet of Jesus. I went to help people who I thought were going to be poor and broken. I remember one of my roommates told me that I was going to have culture shock and be so upset with the poverty and destruction there. I braced myself for that, and I was actually shocked at how false those assumptions were. Sure, we saw houses without bathrooms, beds without comforters, places without electricity, children without clothes, families with little food..but we saw a lot more than just that. In that short week, I got a taste of Haiti for what the country really is.. not a poor or destroyed country.. but a beautiful country full of hope.. full of people who are more rich than I, as an American, will ever be. The people– Oh my goodness. The Haitians I met had the most wonderful hearts I have ever witnessed. Haitians have a way with living life. They embrace it and live it in a way I have never seen before. I didn’t meet a Haitian that got tangled up in a busy lifestyle that we Americans tend to live. They let the days pass slowly to fully enjoy them. The intentionality they had with us was amazing. Our conversations with them were nothing less than encouraging and wonderful. I will hold onto them forever. One day, one of our Haitian friends barely ate any of his lunch, and when we asked him why he hadn’t eaten anything, he said that talking to us during that lunch break was more important than food ever would have been. My Haitian friends have been consistently praying for me and my friends in America anytime I raise a request to them. When asking an older Haitian man who was deaf if we could pray for him before we left his house, he said that he actually wanted to pray for us. Signing his prayer, he prayed for our boldness and strength in our faith, and he prayed that we always remember how strong Jesus is for us. He was so excited to pray for us when we were there to serve him. They cherish relationships more than anyone I’ve ever met here, and they see life a lot differently than we do. They see it for what it really is. Not about the fame or fortune, but about living to glorify God and love people they are around. I learned that the Haitians I met, although might not have a high financial status, are rich in areas that matter. They’re rich in love, rich in spirit, rich in heart, and rich in faith. The sunrises and sunsets– I love Indiana skies, but the Haitian skies I saw were amazing. I have never seen such a beautiful sunrise over mountains and sunset over the ocean. I think my friends and I took pictures of the sky every morning and every night, but could just never really capture their true beauty. The mountains and oceans– BEAUTIFUL. One day I was able to sit in the middle of the ocean in a clear-bottom kayak..to my left were the mountains and to my right was just the bluest water I’ve ever seen. I remember sitting out there thinking that not much of anything could have topped the feeling of awe I had out there in that kayak. It was just amazing. The hope– Haiti has a hope that is almost indescribable. It was a hope I hadn’t really seen displayed in the States. It was a hope that lived every day knowing who held the future and who holds the whole world in place. It was a hope that made me realize that God is way bigger than I ever could imagine. It was a hope that knew no sorrow or doubt. It was one that opened my eyes and heart to see that the way I have lived life as an American for the last 23 years is in no way better or more satisfying than the life of a 23 year old Haitian who has grown up with no air conditioning in the summer or shower to bathe in. It was one that pointed my eyes from worldly things straight to Jesus. It was a humbling but beautiful picture to be painted in front of me. The list could really go on, but for the sake of time..I’ll continue. So, ever since I’ve been back in the states, I have longed to return there..to that beautiful country. Even as soon as I got home, I knew that one day I would want to go back, but I didn’t know how, when, or even for how long. I just knew I would want to go and immerse myself again in the culture and continue to see the work that the Lord is doing there. Well, as I was in the process of figuring out what life after college would look like, I began to contemplate pursuing my desire to return to Haiti. As much as I wanted to go, the fear of not attempting to start a career held me back. After going back and forth, I realized that I needed to commit to the thing that made most sense. Leaving the comfort and only place I’ve lived might not seem like it makes the most sense..leaving the country after graduating college and putting a career on pause might not seem to make the most sense..but when breaking it all apart, it totally did. The reason why is this: I realized that sometimes the route that causes us to feel a bit uncomfortable and uneasy is the best way we can grow more in our faith in Jesus–and THAT is actually what makes the most sense. Growing to know Jesus better and serving Him means more to me than establishing a career, more than making a lot of money, more than saying I can successfully use my degree, more than worrying about missing out on life in Indiana, and more than being comfortable staying in my home town after graduation. Remembering that everyday is sometimes a bit hard, but at the end of it all, it is so obvious to me. Well, long story short..I have decided to serve alongside Mission of Hope once more, but for a little bit longer of a duration. I will be going to Haiti in January after I graduate from college, and I will be there for 4 months. I have decided to give those short 4 months of my life to put everything else aside as far as school and work go, and just serve. So, in a few short months.. 3 and a half to be exact, I am picking up my life as I know it in Indiana and moving it to Titanyen, Haiti. I cannot wait to be there and live life in Haiti for this coming season of my life. I am beyond excited to be reunited with some of my Haitian friends I met in March and cannot wait to meet the many more who I will come into contact with this coming Spring. I don’t know exactly what my time in Haiti will look like, or my time after, but I know that the Lord goes before me (Deuteronomy 31:8) and has already set out good works for me (Ephesians 2:10). I also know that God is good–and as the Haitians would say…Bondye Bon! August has rolled in pretty quickly and that means a few things…1. scarf season is coming 2. football is now here 3. i have a birthday coming up woooooooo and 4. school is BACK … 5th year senior status y’all. Apparently changing your major every semester doesn’t get you a degree in variety or indecisiveness, instead it just makes you stay in school a bit longer until you make up your mind. Some people cannot wait to get out of college. At times I would venture to say that I fall in that same category of being completely ready to graduate and move on to other things…real things… some would say. When conversing with people, I sometimes make comments like, “I cannot waaaaaaait to graduate”..”December can’t come soon enough”..”Thank goodness for one more semester”..”I wish I would have graduated in May”..the list goes on. Yes, those thoughts may be true at times, but when I really sit and think about it, my feelings are actually quite different. I am really seeing the beauty in staying in school for an extra semester. Here are a few reasons why staying one last semester is clutch: I get to spend another semester doing ministry with Cru and investing in freshman girls’ lives and encouraging them to grow closer into their relationships with Jesus, I get to take an extra 4 months to figure out what in the world the next step is for me, I get to have one last semester of 11pm workouts in the rec, I get to spend some sweet time at the reservoir, I get to work with the sweetest of 3 year olds, and I get to live 4 more months with little responsibility compared to what life after college will be like. With a lot of excitement and anticipation for this coming semester, I decided to look back and see what the last 4 years of my life have looked like…. When reminiscing on these years, I noticed that they consist of two completely different girls. I see a young freshman/ sophomore girl who searched for her identity in all different things. Someone who on the outside had everything together, but on the inside was like a box full of mixed up puzzle pieces. There was an emptiness inside of her that no one could see, only she could feel. The other girl I see is a junior/ senior who, by the grace of God, found her identity in the only fulfilling and sustaining thing there is…Jesus. This girl was completely swept away by the Gospel and the love of Christ, and those mixed up puzzle pieces began to all fit together. There was no longer emptiness, but wholeness that seemed to overflow day in and day out. Since then, there have been so many exciting tales and adventures, but the part I love to notice is the switch from lost to found. These last 4 years tell a story of a girl who went from being mislead by the world to being a girl who was engulfed by the Gospel and didn’t look back. Only by God’s grace did this happen. Ephesians 2:8 “For it is by grace you have been saved, through faith. And this is not your own doing; it is the gift of God.” That 20 year old girl, who thought she was figuring her life out, wound up being scooped up and placed on a new track by the One who created the world. Okay, so obviously.. this girl I am referring to is me. God transformed everything: my mind, my heart, my actions…everything. Romans 12:2 “Do not be conformed to this world, but be transformed by the renewal of your mind, that by testing you may discern what is the will of God, what is good and acceptable and perfect.” I literally saw these verses play out and shape the Haley that would begin to live each day for the One who died on a cross that I might have a relationship with God and receive eternal life. So, to kind of switch pace for a second..we do notice that there are lots of great things about college that people love. There is tons of freedom, thousands of people, sports, clubs, parties, and there is food on just about every corner of campus. The thing most people love about college is the minimal responsibility and endless amounts of freedom. Those two things fit together quite nicely. The traditional college student can do whatever they want without having to worry about a crazy amount of responsibilities waiting on them. For most, college is a time to experience things and figure out what you want to do for the rest of your life. See, college years tend to be the years where we “find ourselves.” We find what makes us happy, what makes us tick, what things we’re interested in, and what things we want to pursue in life. In every way possible, these college years were, for me, just that. In fully finding Jesus, that’s where I found myself. In fully finding Jesus, I found what makes me happy..what makes me tick..what I’m interested in..and what I want to pursue and live for the rest of my life. College will forever hold one of the most special places in my heart and may even be in the running for something like: best “season of Haley’s life” award. College has been hands down the coolest place to begin closely walking with Jesus. I am surrounded by people daily who are going through the same thing I did when I first went to college, and I get to share my stories with them. I am surrounded by “twenty something” year olds who are finding themselves, and getting involved in things that interest them. I also am able to be in Bible studies with other believers on campus who share the same life experiences as me. I have met the most wonderful and loving of friends there. Ones who are walking through the same season of life and can encourage me and lift me up daily. The list goes on and on of all of the great things about college… but the one that stands out is this: I fell inlove with Jesus in college. Hands down, that is the coolest part about my college career. I was captivated by the Gospel and it has changed every aspect of my life..for the better. So, in entering this final semester of school I can either be really stinkin’ excited that I am graduating (like I tell most people), I can sit around and be sad that these particularly fun years of my life are coming to a quick close, or I can rest and trust in the fact that my future will be greater than my past. I have so much learning still to do, so much intentionality to be had, and so much love to be given. I am so thankful that I get to spend another semester at Ball State, but I am also really excited to see what God does with my time after I graduate. I can also hold on to the promise of the eternal things ahead. In this phase of life I am not necessarily being invaded or attacked, but I still love looking at the conversation between the prophet Habakkuk and God. After Habakkuk cries to God, God’s response is, “Look among the nations and see; wonder and be astounded. For I am doing a work in your days that you would not believe even if told.” (vs. 5). As I look back and see the beauty of the work of the Lord, I cannot help but be excited to see what is to come. There are sweet things in the past, but there are even sweeter things ahead.